Published: April 16, 2018 at 06:10 p.m.
After 15 seasons in the NFL, James Harrison announced his retirement from football. The once undrafted linebacker from Kent State spent most of his career with the Pittsburgh Steelers, where he won two Super Bowls (XL, XLIII), was a five-time Pro Bowler and was the Defensive Player of the Year in 2008. Take a look at some of the moments of James Harrison's career. 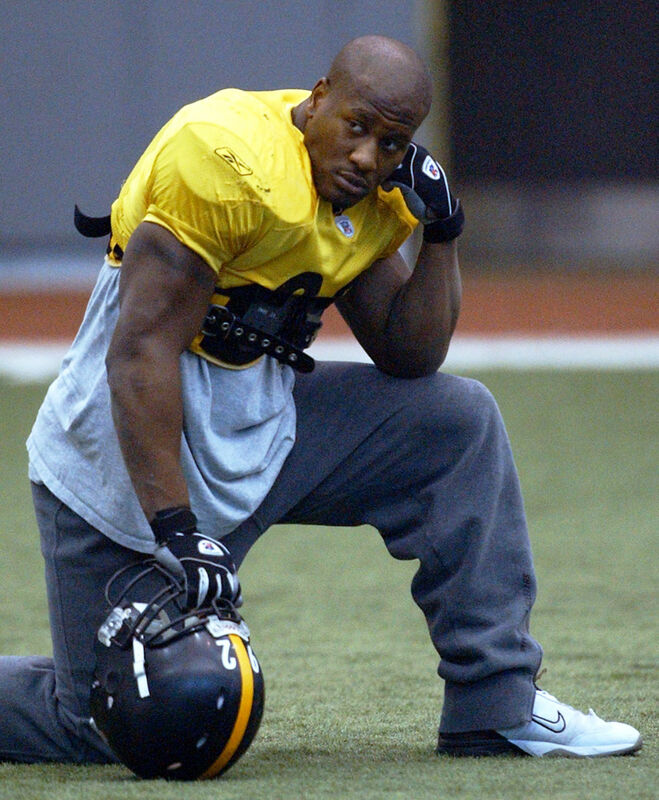 James Harrison, a linebacker cut three times previously by NFL teams, twice by the Steelers, listens to coaches during practice at the team facility in Pittsburgh on Thursday, Dec. 16, 2004. Harrison was expected to start the following Saturday against the Giants and Dec. 26 against the Ravens for the injured Clark Haggans. Pittsburgh Steelers linebacker James Harrison holds the Vince Lombardi trophy during the NFL football team's Super Bowl victory parade in Pittsburgh. Pittsburgh Steelers linebacker James Harrison intercepts a pass thrown by Arizona Cardinals quarterback Kurt Warner and returns it for a 100-yard touchdown during the second quarter of the NFL Super Bowl XLIII football game. Pittsburgh Steelers linebacker James Harrison celebrates after scoring a 100-yard touchdown interception against the Arizona Cardinals during the second quarter of the NFL Super Bowl XLIII football game. Pittsburgh Steelers' James Harrison, left, and his teammate Brett Keisel react after Harrison sacked Green Bay Packers' Aaron Rodgers during the second half of the NFL football Super Bowl XLV game. Baltimore Ravens quarterback Joe Flacco (5) is sacked by Pittsburgh Steelers linebacker James Harrison (92) during the second half of an NFL divisional football game in Pittsburgh. Whether they clash in the playoffs or in early September, when the Steelers face the Ravens, emotions run high and the pressure is intense. Pittsburgh Steelers line backer James Harrison (92) was a five-time Pro Bowl selection throughout his career. Pittsburgh Steelers outside linebacker James Harrison arrives in a Saint Vincent Fire Department firetruck for NFL football training camp in Latrobe, Pa.
New England Patriots linebacker James Harrison runs during an NFL football team practice Wednesday, Dec. 27, 2017, in Foxborough, Mass. The Patriots signed the 39-year-old, five-time Pro Bowl linebacker after he was released Saturday by the Pittsburgh Steelers. New England Patriots outside linebacker James Harrison (92) walks off the field after being defeating by the Philadelphia Eagles in Super Bowl LII.